Ingredients: Probiotic bacteria - Bacillus amyloliquefaciens strain VKPM B-10642 (DSM 24614) and Bacillus amyloliquefaciens strain VKPM B-10643 (DSM 24615) and filler - an extract of corn, potato starch, powdered sugar. Form: Capsules - 50 to 33 mg.
Probiotics Vetom 2 (caps) properties. Biologically active substance Vetom 2 recommended as an additional source of probiotic microorganisms in order to improve the human body. Health benefits provided by the properties of bacteria Bacillus amyloliquefaciens, which multiply in the intestine secrete proteolytic, amylolytic, cellulolytic enzymes, biologically active substances that inhibit the growth and development of pathogenic and conditionally pathogenic microflora. As a consequence of this process in the gut microbial composition is normalized to the corresponding evolutionary current rate, it cleared the wall of indigestible food residue that contributes to the active removal of toxins from the body, the smooth delivery of biologically active and nutrients. salts of bile acids acidity in the gastrointestinal tract. 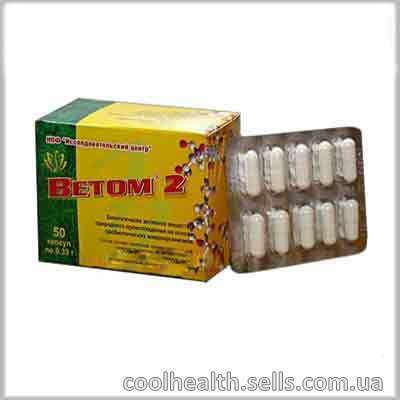 Application Vetom 2 helps the human body to maintain health. Vetom 2 (caps) dosage and method of use. Vetom 2 is administered orally. Multiplicity and duration of admission Vetom 2 is directly dependent on the state of the human body. Recommended for healthy individuals receiving multiple Vetom 2 - not less than (2-3) doses per week. Taken regularly. In the presence of multiple disease reception should be increased to (7-10) doses per day. Board of 2 is not addictive. 1 dose - one package (5 g) or one teaspoon, or one capsule (0.33 g). Vetom 2 (caps) interaction with other drugs. Vetom 2 improves efficiency of drugs and reduces their negative side effects on the human body. Vetom 2 should not be administered orally together with antibiotics and other medications based on probiotic microorganisms. Permissible joint application Vetom 2 and antibiotics using different ways and methods of administration. For example: antibiotics - in the form of injections and Vetom 2 - orally.